Tradition and modernity are perhaps the two poles against which women of South Asia are pitted. The main elements of tradition seem to be comprised of religion. Religion occupies a somewhat difficult position in the largely secular terrain that speak of the empowerment of women. This fascinating volume explores the role that religion, culture and society play in the social and political positioning of women. The collection of essays in the book aims to capture the variety of policies, discourses, debates and interventions that have influenced the lives of women in South Asia and to identify those that have led to greater empowerment of women. 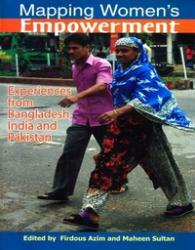 The papers emerge from a workshop held at Dhaka in 2006, where participants from Bangladesh, India and Pakistan presented papers under the themes of 'Voice', 'Body' and 'Work', and probed at the many levels at which the issue of women's empowerment had become one of the central points of national and regional development. The contributors assess the current situation and provide a rallying call for progressive politics that is committed to universal values. The essays also review as well as show us the new directions that are opening up new pathways for women to traverse. The three South Asian nations represented here share a common history of colonisation and nation-making and have had similar cultural struggles.The literature thus emerging from the these presentation, will hopefully open up newer and more innovative ways of looking at women in the region, and help formulate strategies and policies for. the future. This important volume will appeal to anyone interested in issues of equal opportunity, gender discrimination and human rights.